Founded in 1999 and with offices across Prague, Brno and Zlin, Company IMAGE CZ sro offers products and services related to complex installations in system integration of AV technology. 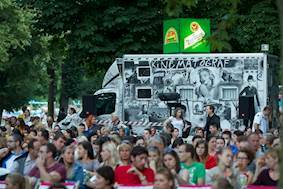 Challenge: Kinematograf Čadíků Brothers (Cinematograph Brothers Čadík) needed four powerful projectors to take on the road for its summer cinema screenings. These needed to be reliable and robust with crisp bright imagery even when projected onto a large screen from a long distance. Solution: IMAGE CZ sro installed four Optoma ProScene EH7500 projectors into Cinematograph Brothers Čadík’s customised projection vans, each equipped with an extra long TZ2 lens. 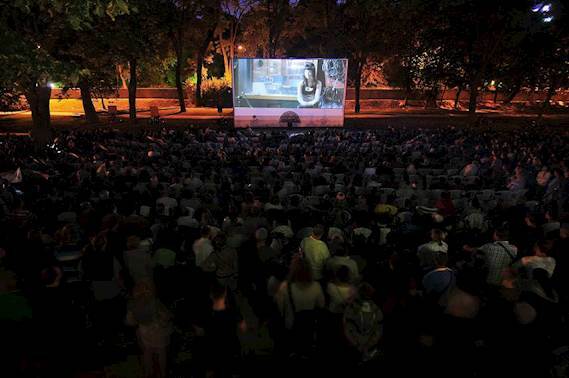 Kinematograf Čadíků Brothers (Cinematograph Brothers Čadík) needed four powerful projectors to take on the road for its summer cinema screenings. The company screens movies in open squares and other outdoor public spaces. This ambitious programme would run from the June until September showing films in more than eighty cities and towns across the Czech Republic and Slovakia. The key requirements for the new projectors were that the projected imagery is bright even when projected from a long distance and with a large image size. It was also important that they are reliable and robust to cope with the peripatetic nature of the shows. The company has been screening films for more than 20 years and previously used an old cinema projector with film reels. IMAGE CZ sro installed four Optoma ProScene EH7500 projectors into Cinematograph Brothers Čadík’s customised projection vans, each equipped with an extra long TZ2 lens. The extra long lens has a throw ratio of 3.67 - 6.98:1 and a throw distance of up to 75.2 metres. It can create an image size of up to 500 inches (diagonal) and has the added advantage of motorised zoom (1.9x) and motorised lens shift (horizontal and vertical). The EH7500 projector was chosen due to its outstanding brightness (6,000 ANSI lumens) and clear imagery created through the WUXGA resolution (1920 x 1200). The dust-sealed, filter-free design prevents dust and dirt from affecting the system and ensures optimal image quality with minimal maintenance. 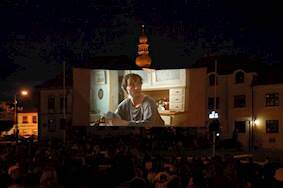 The summer of film saw four films in Czech and five films in Slovakian screened in more than eighty cities and towns across the Czech Republic and Slovakia, many of which do not have their own cinema. The public’s reception to the films was exceptional and the films well-received. 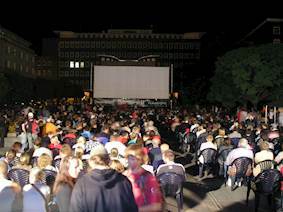 Visitors to the outdoor movies are asked for a voluntary contribution that goes to various Czech charities.